This Christmas I really want eerything we give to say I thought of you. Most of the problems I always seem to have when buying gifts are that I simply do not know what that person will really love. So instead of spending hours scouring the shops for gifts I am on a mission to make my whole family their gifts myself. Most of what I am making will be new but I do have one today that I made from 2 sheets which I picked up in a charity shop for around £6. I used under 1/4 of the two single sheets I bought to do this. First I needed to remake the pattern myself onto baking paper. I prefer baking paper as it is much easier to keep as it takes up less space and it also means you can use the right ammount and never be left with small useless end bits of tracing paper. Another plus is that it's much stronger than tracing paper, making it easier to use. If you want to make your own pair of PJ's but you do not have a pattern you can make you own by turning a pair of the correct sized PJ's inside out and tracing these as your pattern but remember to add on an inch or 2 at the bottom and a good 3-5 inchs at the top for your seams! Also note you need to use a pair that do not strech very much or you will end up with a pair the wrong size..
Once I had each piece from the pattern drawn and cut out in the correct size I then got on with folding my fabric to get the various ammounts of each shape I needed. I used the lightblue fabric for the bigger main pieces of the PJ's and the darker blue fabric for all the smallers trimmings on the PJ's. Next I took the Fabric and folded the end piece over just enough to fit the largest piece of the pattern onto the fabric while getting 2 pieces of fabric after I cut it. 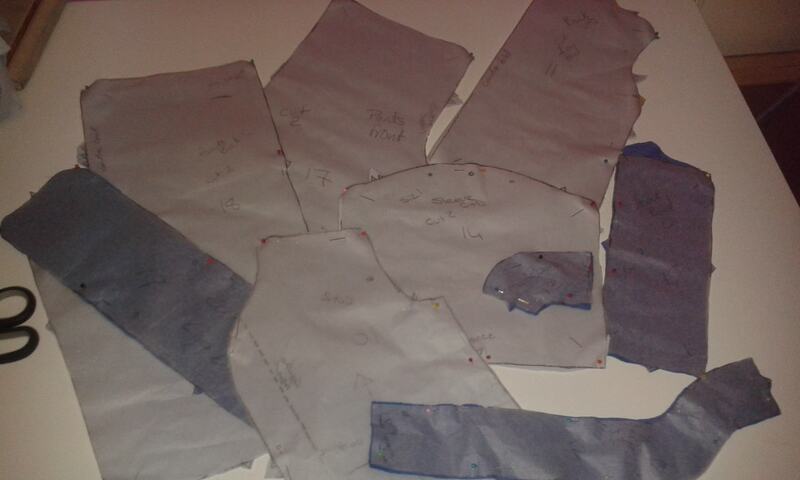 Once I knew there was space to have 2 of each pattern piece I got to pinning down the pattern pieces to the fabric. I did this by using berry pins to keep the fabric in place. I cut each one out indiviualy by carefully cutting around the pattern pieces. 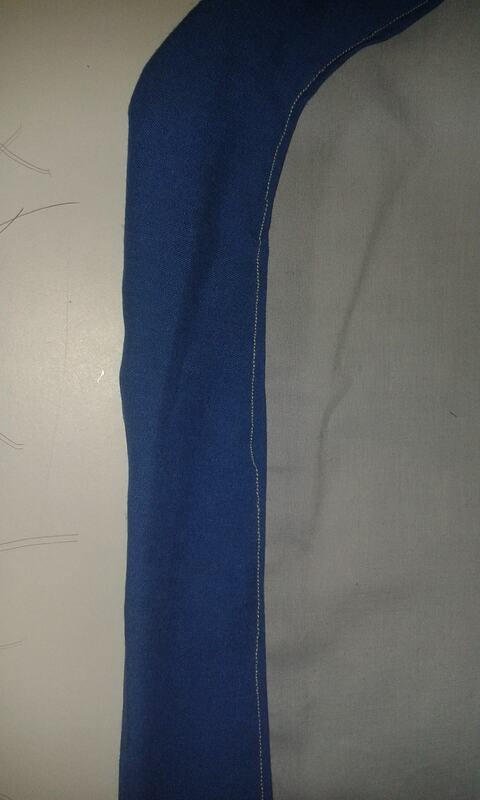 To cut out the neck line in the darker blue I folded the fabric again to achieve 4 of each piece for this. After I had all of the pattern pieces cut out I left them all attached to the pattern pieces only removing the pieces I needed as I needed them. I started with the bottoms. To start the bottoms I used both the front and back leg pieces. I lay both legs out attached along the inside leg seam with berry pins. Once i was happy that both pieces matched up I started to sew the seam together on the sewing machine. I used a strong stitch as they are for a 1 year old so they need to be durable! 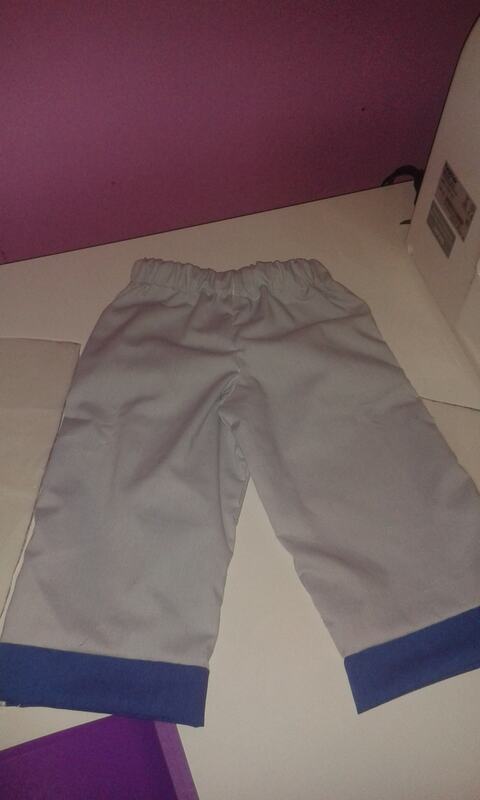 Once the seam was done this is how they looked. Next up I needed to sew the crotch seem which is pretty easy now that both legs are sewn together. I took the edges of each leg and started again to attach these using berry pins. After a few minutes I had the whole seam together. 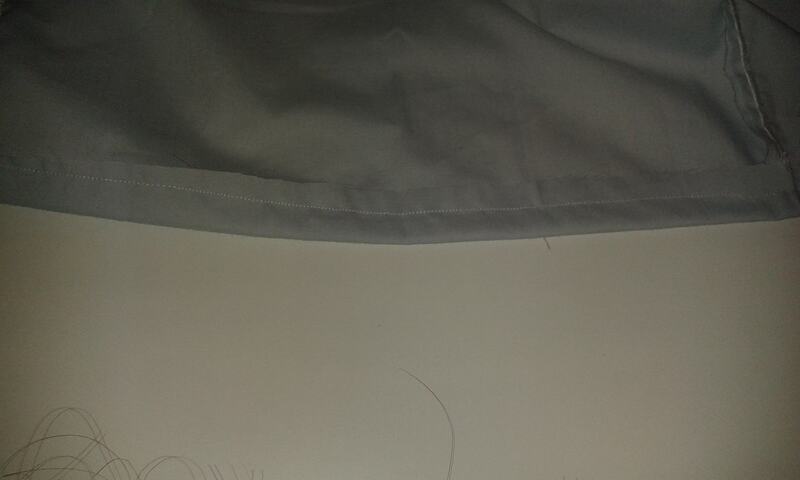 This time I stitched the whole seam in one on the sewing machine. 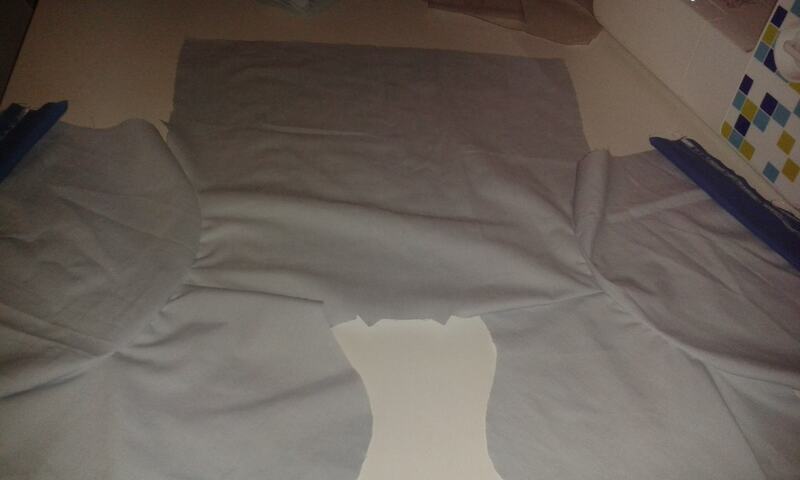 Here is what you should have if you attach both legs together before the sewing. Now that the legs are almost finished I needed to add one the leg trim. I did this by again folding each leg trim in half. Once it was in half I attached this to the bottom of the leg on the bottom front of the leg. 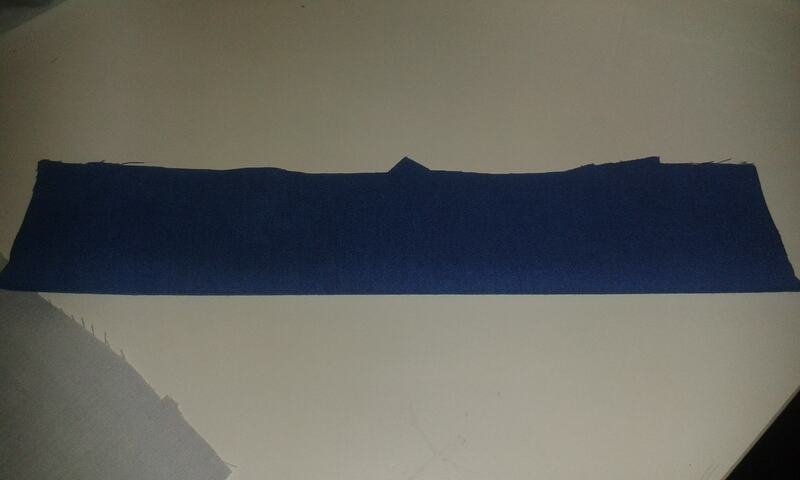 If you are doing this it is important that you attach this with the front of the trouser touching the front of the dark blue trim. I pinned this all the way around the leg piece and stitched using the machine. Below are a few pictures of this process. After I had attached the trim on both legs I needed to sew up the final leg seam to actually create the legs shape. I pinned the seam together and stitched both legs up. I now had the general shape of the PJ bottoms. The final thing to do was to create the elastic loop which will hold the trousers up. I use a pair of D's old 1 - 2 years PJ bottoms with elastic. I measured the elastic around these trousers. Once I had the size i stitched this together a few times to be sure it wouldn't come apart. I then added this around the top of the PJ bottoms . I didn't pin this together however if you would like to that is fine. I lined up the first section using my hands and using the sewing machine I stitched this together. I repeated this in sections the whole way around ensuring that the fabric was flat and straight during every section. This did involve repeatedly pushing the fabric along the elastic. It doesn't need to be perfect here but they will fit for longer if you allow the fabric room to stretch. Voila I now have one pair of PJ bottoms! I am really proud of these as my first attempt at this pattern went so horribly wrong! Right I then had to start the top. This was the harder part as there are lots more pieces and they are a bit fiddly to put together. I didn't manage to get many pictures of this part however the process for everything is almost the same as above. To get started I attached the back and the front of top to each other by pining and stitching the shoulder seams together. Once i had the top seams together I got to work on the arm pieces. 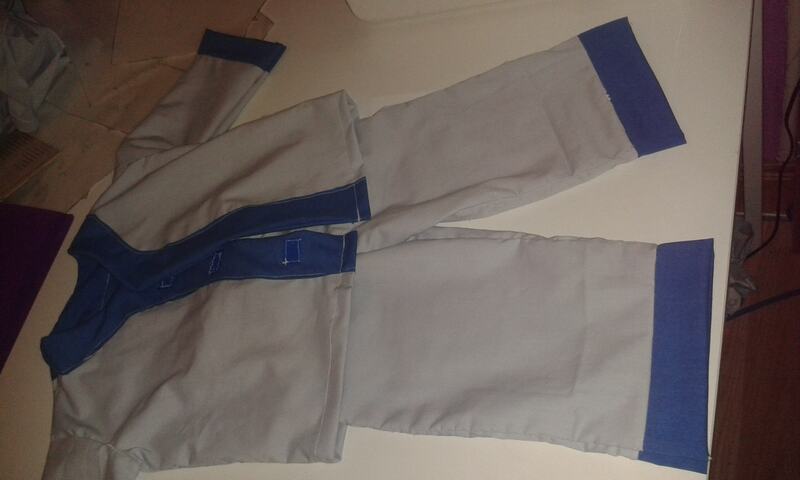 I attached the trim on the bottom of each arm using the same process as above for the trousers. I then pinned the arms to the right places on the top. Again using the sewing machine I stitched these in place. Once this was done the out come looked like this. 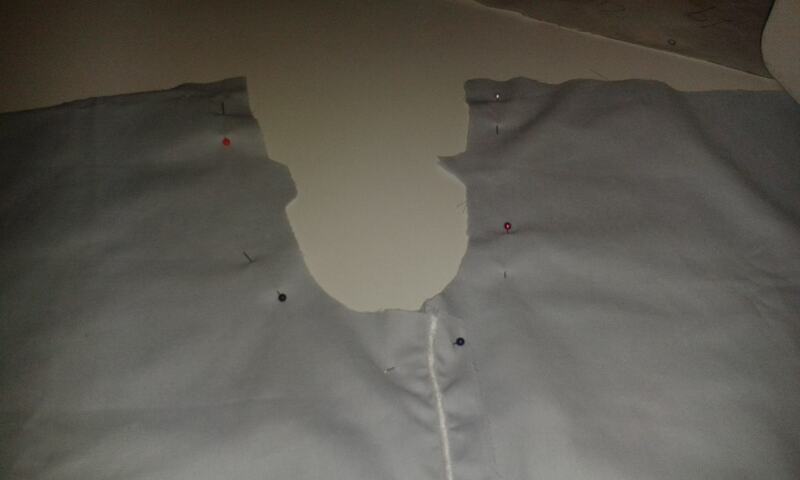 The final few steps are to attach the trim around the neck line and to sew all the final seams. I started with the neck line pieces by placing them on the table and creating two pieces of fabric from the 6 i started with. I attached the back neckline piece to the two front pieces and repeated the process to achieve two pieces that are the full neckline. 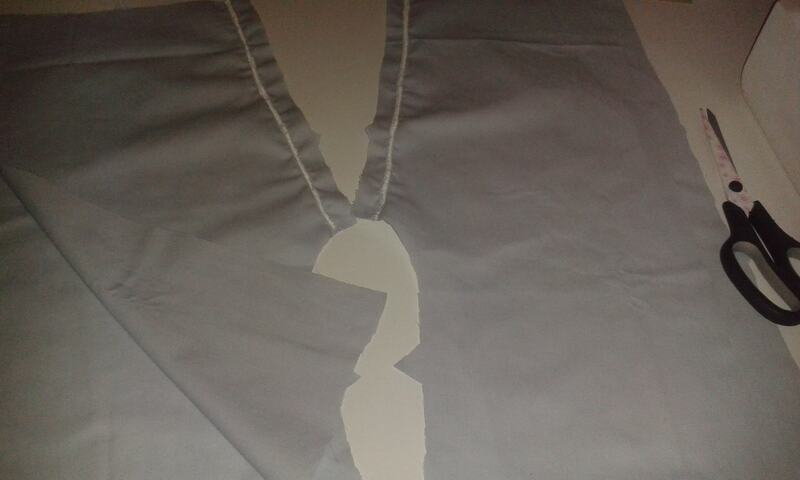 I then put both pieces together and attached them along the inside seam which matched the shape of the tops neckline. I then turned the piece in the right way ensuring that the outline edges where clear. I attached and pinned the piece section by section. I attached this by using a pin to fold a small amount of the fabric under the edge on the front. Don't worry about the inside seam as it will not show. 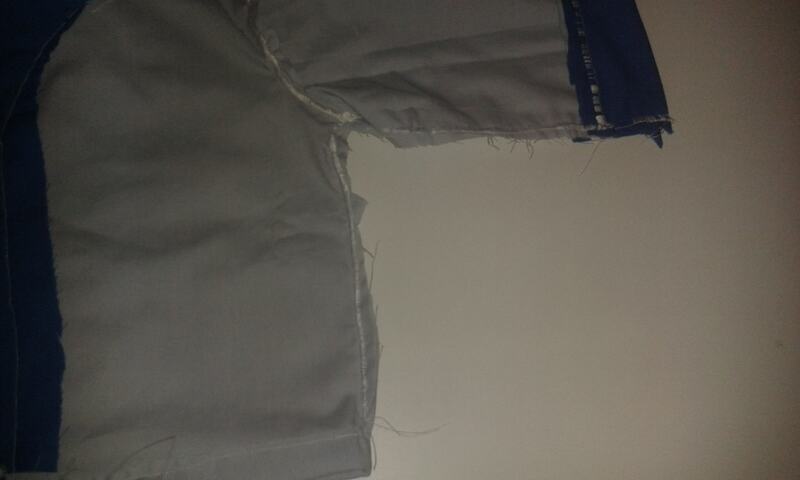 After I had the whole seam pinned in the same way I started sewing them together using one long line of stitching. The next thing I did was to attach the side and arm seams together. 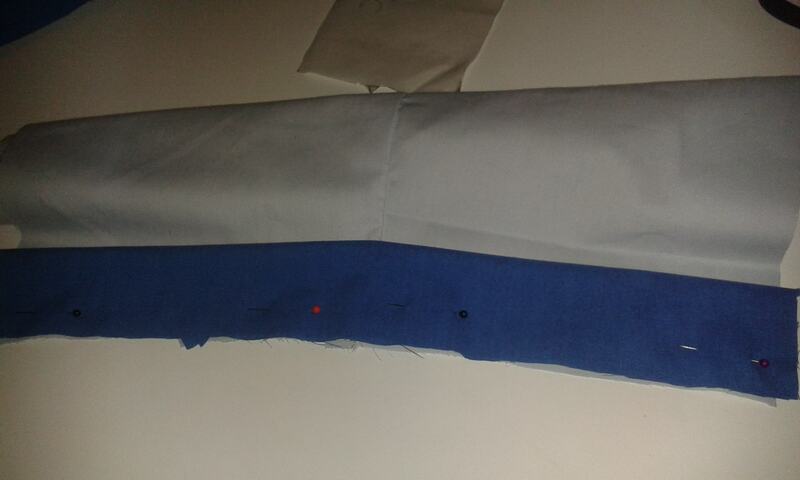 Again this is one long running stitching which will sew together the side and arm in one go. I used berry pins to pin them together and stitched them on the sewing machine. the final product should look like this. Now to make the seam along the bottom of the top itself. I opened the top up and folded a small section of fabric over pinning it in place. Then stitched this in a line stitch all the way along. Finally instead of using buttons and attaching button hole to the top i used some Velcro. I attached 3 small rectangles of Velcro using the sewing machine on the inside piece that you do not see. 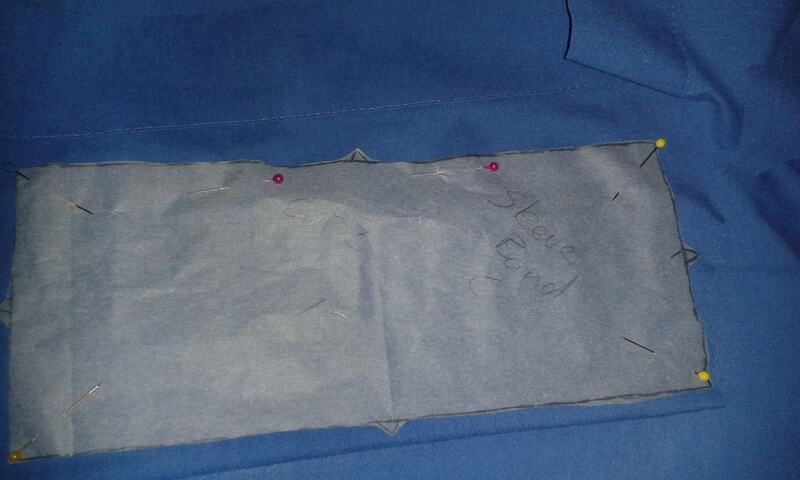 I then hand stitched on the other side in the right places using the already attached Velcro as my guide. I carefully attached these pieces to only the first layer of fabric so it wouldn't show through on the front of the top. Here is the finished top and trousers together. I am very happy to say I made these all on my own! These are my first pair of PJ's that I have finished. I tried to make these before but it didn't work out so well. 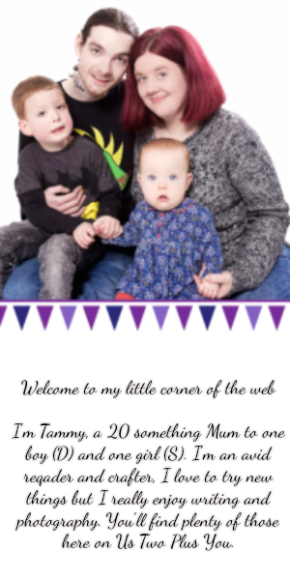 I do think they look rather professionally made and I hope my mum and brother enjoy them.